Save Water, Save Heat, Save Money - With The Original EcoSavr Liquid Swimming Pool Solar Cover Fish! So easy to use ! Snip it, Toss it, & Relax ! 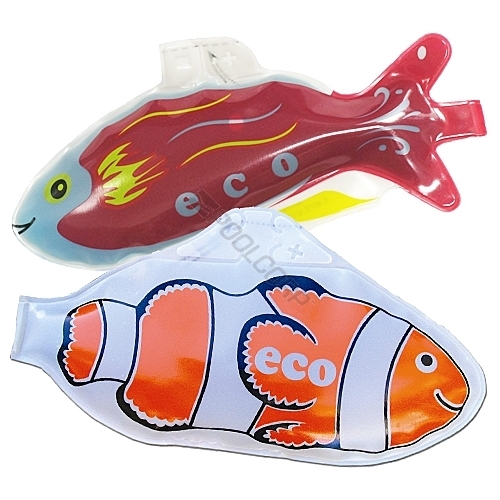 Actual EcoSavr Liquid Solar Cover Fish - How Cute ! EcoSavr Liquid Solar Cover Fish Save You Money ! New and Improved Ecosavr™ is a Liquid solar cover for swimming pools: an alternative to conventional solar covers. Simply snip the fin where indicated and toss "Eco" in your pool. Ecosavr™ submerges to the bottom of the pool and as the pressure increases, the liquid escapes, rises, and forms an invisible layer on the surface of the water. It is 60% as effective as a conventional solar cover but 100% less trouble. It works 24 hours a day, even while people are swimming. Ecosavr™ will last for approximately 1 month. Then all you have to do is retrieve "Eco" and toss a new one in. Evaporation accounts for up to 7/8 of heat loss from a swimming pool. A single Ecosavr™ contains liquid which automatically floats to the surface of the pool and acts as an evaporation inhibitor, much as a conventional solar blanket performs, except a lot easier to use. The key ingredient is a non-toxic chemical called Heatsavr; it's been in use since 1991 and has a proven track record commercially. It is packaged to facilitate its application for the residential pool owner. Heatsavr™ is filter friendly, does not affect the chemical balance (PH, chlorine, alkalinity) of the water, will not damage vinyl liners or any other pool surfaces, and is absolutely harmless to skin contact.